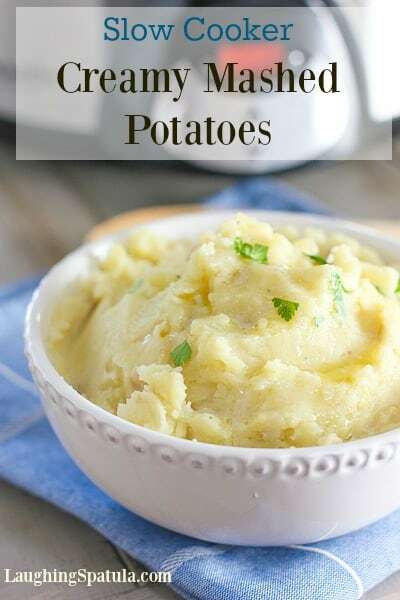 Creamy Slow Cooker Mashed Potatoes– An easy dish for any weekend or holiday! 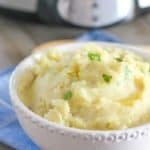 Super easy and creamy mashed potatoes! Cooked and mashed up in your slow cooker. Cooking and mashing up these taters in the slow cooker gives you and your oven a little more time and space. 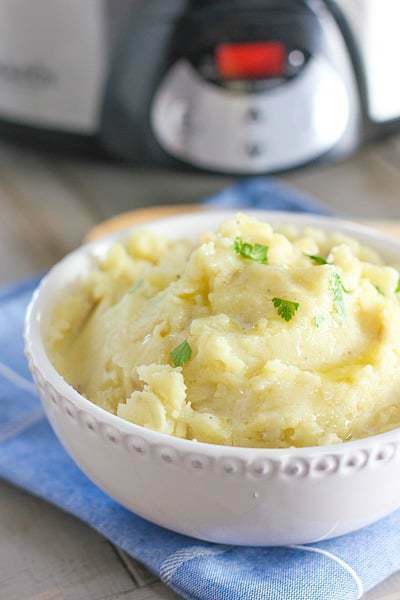 The secret to creamy slow cooker mashed potatoes texture is using Yukon Gold Potatoes. They are creamy with a lovely yellow color. Using Russet potatoes in the slow cooker can turn your mashed potatoes mushy and kinda brown. Red potatoes will work in a pinch, but I love the texture of the Golds. You can leave the skin on like I did, or peel them, but peeling is a time sucker and you don’t have any more time, remember? I left the skin on, they practically dissolved. No complaints. Just dice up your potatoes, toss them into your slow cooker with a cup of broth, some butter, salt and pepper. Cover and cook two hours on high or four hours on low. Most of the new slow cookers run pretty hot. If you are using an older version you may have to adjust the time a bit. My cooker is new and I cooked them two hours on high. They worked perfectly. Just give them a poke now and then to make sure you don’t over do it. Once cooked, simply use a handheld mixer or hand masher. Plunge right into the slow cooker, add your sour cream, milk, additional salt and pepper and mix it right up! Turn the slow cooker to warm and your taters will be ready when you are! You could add garlic, grated cheese, parmesan or whatever other add-ins that your family loves. Our potatoes serve as a vehicle for gravy, so I like to keep them pretty simple. You might also like my Make Ahead Ciabatta Sausage and Apple Stuffing! Oh! Do you need easy make ahead gravy? I got ya covered there! Who’s your buddy…who’s your pal?! Creamy Slow Cooker Mashed Potatoes are a simple crowd winner for holidays and lazy Sunday afternoons! Scrub potatoes and cut into one inch dice. Top with 2 tablespoons of the cubed butter saving the remainder for mashing. Sprinkle with 1/2 teaspoon salt and 1/4 teaspoon pepper. Cook on high for two hours or low for 4 hours, stirring on occasion and checking for doneness. When potatoes are cooked and a fork slides easily into them, add sour cream and additional butter cubes. Mash or whip with electric mixer. Add milk as needed to reach desired consistency. Reduce temperature to warm until ready to serve! I love mashed potato, but I’ve yet to make it in the slow cooker. Yours looks absolutely delicious, I need to try this! Any recipe in a slow cooker that makes my life easier…im in! What a clever way to free up oven and stove space and still have delicious creamy mash! Hi Ange – thanks for the note! I used to make them and then put them in the crockpot to keep warm…this is a whole new wonderful! This was my first try and it worked really well! Thanks for your note Heidi! 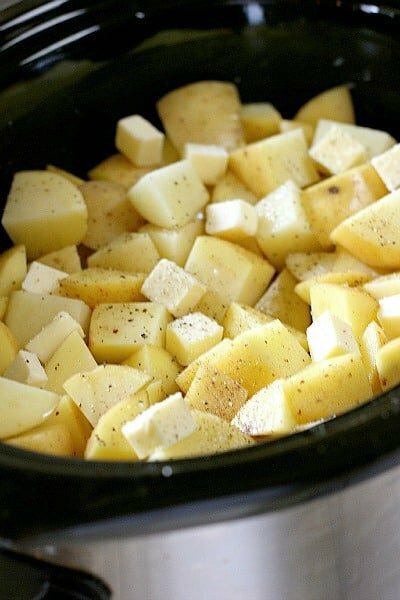 I love using my slow cooker….and making potatoes in it is a WONDERFUL idea….so easy….so good!! I’ve never tried making mashed potatoes in a crock pot before. What a fabulous idea! What a great idea. 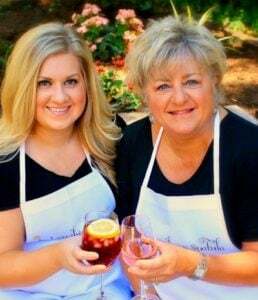 I’m definitely going to pass this recipe on to my mother in-law. Thanks for sharing ??? ?